The rituals were complete. It had been a grueling morning, rising before the sun so that the initiates could be ready when it rose over the spires of the fortress, its cold radiance illuminating their naked bodies as the wordsmith etched the ancient words of warding into their flesh. With needle and hammer the wordsmith worked his magic, as the Guardians chanted the canticles of our legacy, infusing the word made shield with the ancient Magics that would protect the initiates against the trickery of the Sleeper. Hour upon hour passed as the Wordsmith labored on the bear flesh, his craft unrushed as the sun climbed in the sky and the snow fell, infusing the courtyard with a mystic air, as the smell of incense and blood mixed with the droning chant of the Guardians. Finally, as the chant grew in intensity, we approached the end of the ritual. Taking the Brand of Ice between his hands, the brought it down on the chest of each initiate in turn, eliciting from them the words of the Oath: "We labor, so others may live in ignorance. We fade, so others may not" , and with that, the initiates were done, they were one with us, members of TLPD, protectors of Teamliquid, and guardians at the gate, against a horror that other forum-goers remained blissfully unaware of, the names of these new-forged heroes added to the archive of protectors. Casting upon their shoulders the wolfskin mantle of the guardian, I was the first to welcome them to the meadhalls of the fortress of TLPD. As we feasted in the great hall, the warmth of bodies and flame a bastion against the frost at our windows, one of the initiates, PolskaGora, approached me, curiosity and pride shinging in his eyes, and asked of me a question, a question that every Guardian of TLPD has wondered upon initiation. "What now? ", and so with a hearty chuckle, I gave him the answer every Steward has given since time immemorial. "Now, we feast. Then we remember. Tomorrow, we protect". This was the sign though, the sign to begin the ancient ritual of remembrance. With a roar I brought the feasting and conversation to a sudden and abrupt halt, and began the ritual. As I spoke, silence permeated the room, the only noise the faint crackle of the fire as the logs burnt. "In an age long gone by, when the world was young and the forums were but a struggling collection of threads, held together by the power of a scant few users, bound together by the power and vision of a handful of warriors and wizards. Names of legend like Nagzul, Meat and Rekrul fought against the encroaching darkness of the internet, armed with only their wits and sorcery, a darkness rose. A terrible being, its name long forgotten by man, it came, and it hungered, it lusted for human ignorance. It came at the forums, and the forums, not having been on guard for such a being were ravaged. Assailed by this, Manifesto7 the Hammer and Sickle, consulted the oracles, and found no solace in their words. Unaided by a diffuse augury, he took to the threads of Teamliquid, where he enlisted the aid of two promising young men, two stalwart volunteers dripping enthusiasm, despite the magnitude of the threat. They were Kennigit and thedeadhaji. These two were tasked with a single job, to acquire 'statistics' by any means possible, so that they could be used as a weapon against the being. As the two warriors labored, the Hammer slough the aid of a wizard. A man of legend, a sorcerer of great power whose might might rival that of the great saro. A man known only as PoP." At the utterance of the sorcerers name, the fire in the room flared for an instant, as if emboldened by the name of its master. "These three, unbeknownst to themselves, would become the forefathers of legend, who would establish the legacy that keeps these forums safe. As the two warriors did battle with the fiend, using only ancient tools, a single massive excel sheet and an ancient protocol known as msn. They found the task was far beyond them, their archaic weapons were no match for the furious hunger of the beast, which by now had been branded as the Devouring Ignorance. For weeks the two warriors battled, delving into the darkest reaches of TL in search for knowledge powerful enough to bind the Ignorance. As they delved they were assailed by the fiends and daemons which haunt the darkest corners of TL, and little by little their armor and their resolve crumbled. It was at the point of despair that Manifesto returned, carrying with him a mighty talisman forged by the great wizard PoP. Wielding the talisman, he cast the creature to the abyss, bound it in chains forged of the very data the two warriors had been collecting, and sealing it. The wizard had given the talisman with one caveat however... 'to keep the seal, knowledge must never falter'"
I paused, simply turning to the words etched above the meadhall: Knowledge must never falter, etched in silver. "These three were the first guardians, aided by the great wizard, they assembled this fortress and set out to keep it strong. Along the way they gathered the first order of initiates, p4NDemik, Jonvvv, dozens of distinguished names. Alas, with time warriors fade. Soon Manifesto was whisked off by a dark sorceress, Kennigit resigned to a quiet life of teaching initiates after wounds inflected by a fell beast, thedeadhaji vanishing in a massive explosion that took out the entirety of the northernmost tower. Many great battles were fought, including the great war of Starcraft2, where the entire of the left wing of the fortress was erected from the knowledge collected from battling the spawns of the Sleeper. Despite the best efforts of these heroes, despite the initiates becoming legends in their own right, even as the wizard slumbered in his tower, the Sleeper cast his dark influence, trying to once again rise as Devouring Ignorance and wreak vengeance upon those who had sealed it away for all those years." The fortress trembles, settling down on itself, a reminder that its stone walls lie on the Seal that keeps the Sleeper at bay. 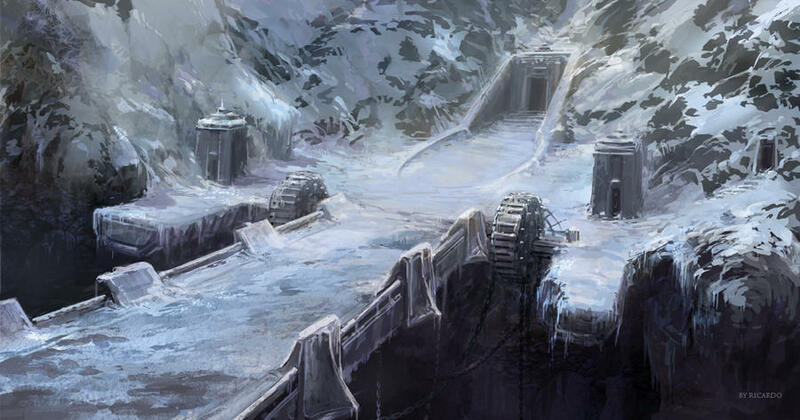 "Over time, the warriors of legend faded, their minds and bodies given up in the defense of the fortress. One by one they faded and vanished, some casting off the cloak of guardianship. One by one, until only two remained. Two stalwart warriors in the great hall, and a wizard, locked in his tower. Zere and Jonvvv, battling alone against the darkness, as shadows and despair encroached. Alone, the cloaks of the dozens of legends before them fluttering on the walls of this fortress, they prepared for one last night against the shadow. One night before the influence of the Sleeper finally overwhelmed them. Back to back, they knew there would be no dawn." At this, the fires grow dim, and everyone feels the oppressiveness of the unnatural darkness outside, the gloom seeming to threaten to engulf the light without warning. "So the darkness came, and the two stood back to back, knowing full well that with this last battle they had earned the titles of legend with this one last battle. But from the walls of the fortress sounded a horn, a blaring, loud thunderous horn. A horn of vengeance and knowledge. From the darkness they came riding, blades cutting strands of light as they sealed the gaps of the crumbling walls and fought back the darkness. The Coins of Liquipedia had rallied. Someone had heard of the plight of TLPD, and despite their stoic refusal to plead for aid, come anyway. Twas a fierce fight against the shadows, but the sheer weight of valor and knowledge was sufficient, barely. To plug the gap, just in time for the legendary battle against the arrival of the Host of HotS." Many shudder at the memory of the Host of HotS, a battle that had brought them this crop of initiates, despite a fearsome cost. "But that was a sign, the Coins were our staltwart allies. TLPD would not fall again. The wizard roused from his slumber and set about forging a new TLPD, a mightier TLPD. TLPD2. Meanwhile the Guardians labor, to keep TLPD strong, to keep the darkness of ignorance at bay. This morning you rose as acolytes, initiates, unaware of the legacy you fought for. Tonight you feast as Guardians, protectors against the Sleeper." A rousing chant starts among the Guardians, a motto, a legacy. Although I am prepared for my own eventual demise at the hands of the Sleeper, I feel better knowing that you are the one helping me forge my own shield against the darkness. It overtakes those with weak constitutions, and this shield of mine I will take to every battle, and will allow to lead me through every unknown passage. Although the darkness can never be conquered, only subdued, I hope it serves me well and resists the blows of the enemy for many years to come. Ok this is really awesome. This is EPIC (soundtrack rofl). What is that picture from? This blog gave me nerd chills. 10/5 if I could. TL - for the greater good. I really feel like fighting some orcs or something now. Each sound-track gave me multiple sets of chills, not nerd-chills but real shivers up and down the spine. The music made all the difference. The historical references worked beautifully with the fantastical style.